are designed to quietly cool AV equipment rooms and closets, and to ventilate various air circulation and exhaust projects. Features an inline speed controller utilizing PWM-technology. Containing an inline mixed-flow design, the fan can maintain airflow even in high static pressure applications. The motor box containing the fan’s impeller and blades can be detached from the mounted frame for easy cleaning and maintenance. The complete kit includes one duct fan unit, two duct clamps, installation manual, mounting hardware, a corded AC plug adapter to power the unit through a standard outlet, and EITHER a speed controller OR a thermal controller & one corded thermal probe. 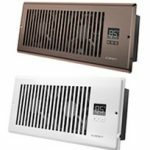 are designed to be mounted onto wall or floor registers to boost airflow. By increasing warm and cool air coming from weak registers, you can increase room comfort and reduce energy costs. 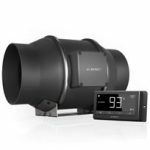 Features an LCD display with smart thermostat control and customizable fan speeds. The mounting frame is constructed of aluminum in either brushed bronze or painted matte white finish. Includes hardware and power supply needed to secure the unit onto an existing register opening and power it through an outlet. are designed to control the temperature and humidity levels of your crawlspace, basement, attic, and garage. These systems reduces humidity levels to prevent mold growth while exhausting out odors and other harmful pollutants like Radon from your home. They feature an LCD display with smart thermostat and dehumidistat control, as well as customizable fan speeds. Included corded sensor probe plugs into the controller to provide temperature and humidity readings. 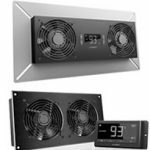 Features dual 120mm PWM-controlled DC fans that are highly efficient in maximizing airflow at lower noise and power levels. 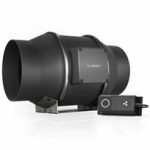 Includes hardware and 8-foot corded power supply needed to mount the unit onto a surface and power it through an outlet. The controller included with each unit features active temperature and humidity monitoring. Fan speeds can be programmed to automatically adjust to high and low temperatures and humidity. The program can also be manually set the fans to run continuously or on a timer at custom speeds. Also features alarm warnings, fan failure alerts, eco-mode, and backup memory.